The statistic shows an estimate of global steel demand between 2016 and 2019, by region. 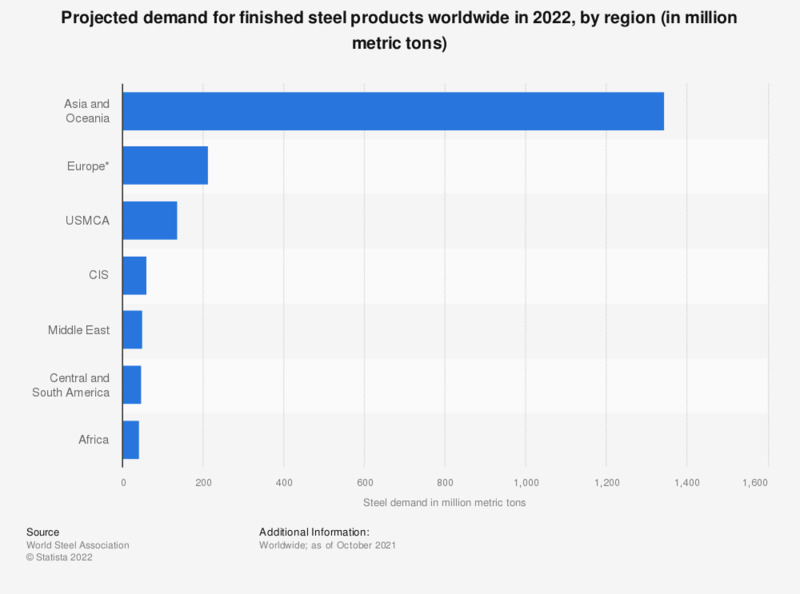 In 2019, it is predicted that Africa's steel demand will reach 38 million metric tons. Steel is an important material used in shipbuilding and car manufacturing, as well as building construction and infrastructure development. However, from 2009 through 2013, the steel industry experienced a challenging period including the upheaval in the US financial markets, slowing economic growth in China, as well as the eurozone sovereign debt crisis. In 2016, a little over 1.54 billion metric tons of finished steel products was consumed globally. This figure represents a 0.5 percent increase on 2014, when just over 1.5 billion metric tons of finished steel products were consumed globally. In 2018, worldwide apparent steel use is estimated to grow to around 1.6 billion metric tons. The increase will likely be spurred by gains in the NAFTA and EU regions, as well as growing demand in emerging economies. Meanwhile, China is expected to experience flat growth apparent steel use between 2016 and 2017. The market for steel scrap and steel recycling is predicted to spell trouble for the steel production sector. * The values refer to finished steel products. The figures for 2018 and 2019 are projections. The 2016 figure was taken from a previous edition. Everything On "Steel industry in Europe" in One Document: Edited and Divided into Handy Chapters. Including Detailed References. Statistics on "Steel industry in Europe"